The Caz piano program is offered as a primary instrument in all sessions. The piano program includes both individual coaching and the opportunity to participate in chamber ensembles. The primary focus of the piano program is classical, but we offer a jazz ensemble elective as well. Daily group activities include improvisation, theory, technique and interpretation, developing practice skills, and listening to great recordings. Students practice three hours each day, during which time they receive at least a half hour of individual instruction. This varied and intensified learning environment accelerates the students progress and helps them to focus for longer periods of time. Students are challenged to do their finest work in a relaxed, supportive atmosphere. Specific goals are to polish one learned piece, finish a work in progress and prepare one or more pieces for the final concert performance. Because we are only able to accept twelve piano students per session, the Caz Piano program fills up fast! Therefore we recommend you register as soon as possible. For more information contact the Cazadero Berkeley office at 510-527-7500. Jazz Piano is available for one week only during a two-week session. Therefore, your student should have enough technique and interest in the classical genre to accept instruction and play in classical ensembles in the second week. 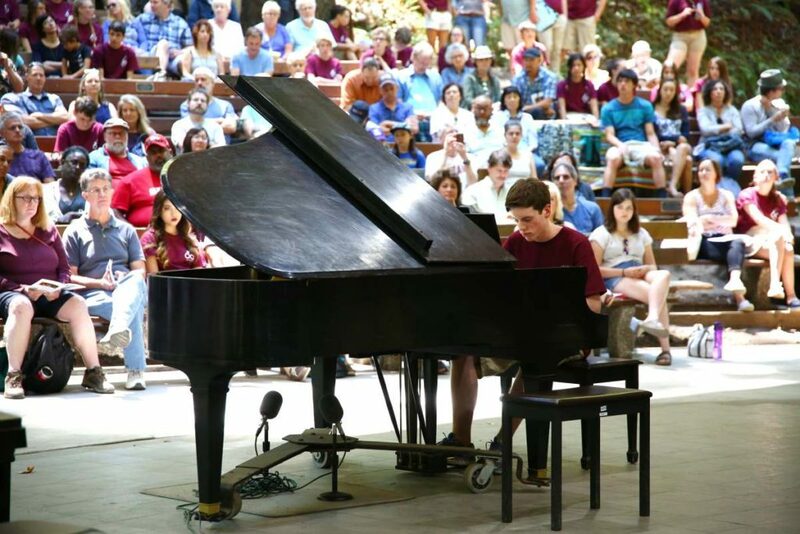 Cazadero requires a recorded sample in an audio/visual format from all piano program campers. This is used to evaluate the student’s technique and musicality. Piano campers are sent information about how to make and submit this recording when they register. Samples should be sent to us as electronic files. Files can be uploaded to our google drive or sent with a link to your own file storage. Recordings may be made specifically for this submission, or you may send a recording from a recital or other recorded performance. The recording should show the students hands as they play. If you have any questions please call the Berkeley office, 510-527-7500; we are happy to help! Piano campers receive a detailed email describing their unique requirements when they register for camp. They will be asked to submit a recording of a polished performance and a recording or a “work in progress”. If your student is interested in the jazz program an additional jazz piece can be added to the above repertoire. There is a $125 lab fee for the piano program.